Looking for a pediatrician for your newborn? 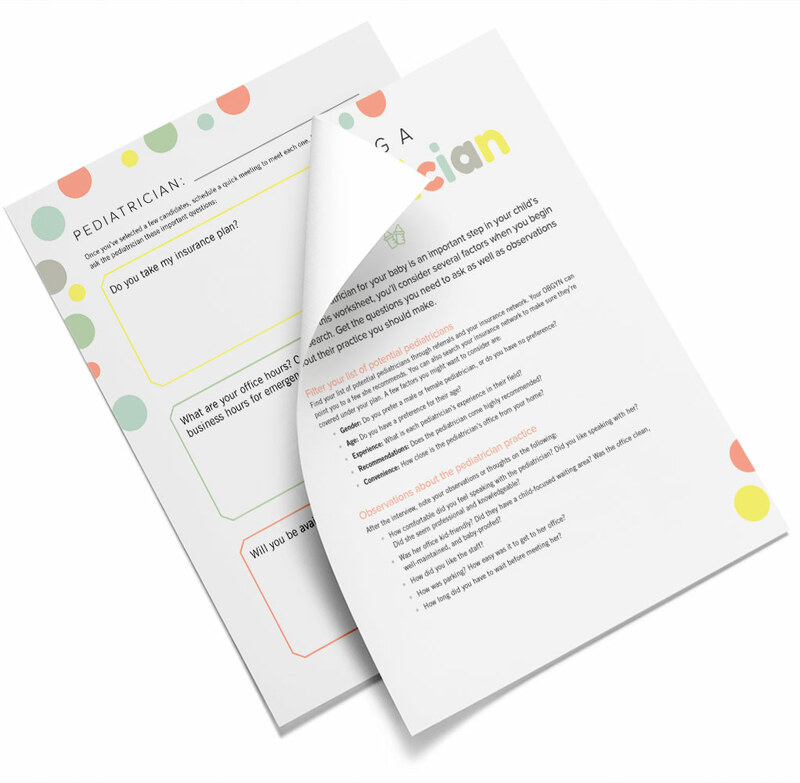 Discover 15 interview questions for pediatricians you need to ask at a meet and greet (with a worksheet!). If there’s one thing you can’t put off until after your pregnancy, it’s finding a pediatrician. You may have been able to find an OBGYN after you found out you were pregnant, but not so with your newborn’s doctor. You’ll need to find and select a pediatrician before the baby is born. You see, the baby’s first doctor’s appointment happens right at the hospital after he’s born. The pediatrician will take a look at him and likely visit each day you’re there. She’ll also be the one who’ll discharge and claim the baby fit to go home. Not exactly something you can put off to the last minute. So, how do you find the right pediatrician for your baby? And how do you even start or filter potential candidates? It comes down to visiting and interviewing potential pediatricians for a meet and greet. But if you’re a first-time mom or perhaps find yourself starting a new search, you might not know the right questions to ask or where to even begin. Don’t worry—I’ve got you covered. I wanted to make sure my son’s (and later, my twins’) doctor was someone we all felt comfortable with, and someone my kids could preferably go back to for years to come. I’ll share a few factors you might want to consider when whittling down your choices, and resources to start your search. Once you have a few in mind, the best way to make the right decision is to visit and talk to pediatricians. Below, I share the top 15 questions you need to ask as well as observations to make about your visit. Your insurance network. Start your search within your insurance network. Don’t waste time making appointments with potential pediatricians if they don’t even take your insurance provider. Referrals from your OBGYN. Many OBGYN practitioners can refer all types of doctors, including pediatricians. The best part is that many of them categorize their referrals on whether these doctors are part of your current insurance network. If your doctor is already included in your insurance network, then she can point you to pediatricians she recommends and are also part of the network. Referrals from friends and family. Many of us rely on personal recommendations since we can get an honest assessment and trust friends and family. Make sure that pediatricians they recommend are included in your insurance network. Gender. Do you have a preference for a male or female doctor? Age. Do you have a preference for their age? Experience. What is each pediatrician’s experience in their field? Recommendations. Does the pediatrician come highly recommended? Convenience. How close is the pediatrician’s office from your home? Do you take my insurance plan? Will you be available around my due date? What happens if you’re not available (either when I’m ready to deliver or for regular appointments)? Is there another pediatrician to cover for you? Will you be able to visit for the first-day check-up? Will you be the one to discharge us? Can we still reach you during non-business hours for emergencies? What is your typical well-baby schedule? Are you able to do standard lab work or vaccinations in your office? What is the typical waiting time for a standard appointment? If my baby gets sick, will you be available for same-day appointments? How far in advance do we need to schedule well-baby appointments? What is your late or cancellation policy for appointments? There are many perks to meeting the pediatricians in person, instead of relying on online information or a phone conversation. Not only are you able to get a feel for the pediatrician’s demeanor and personality, you can also see her practice in person. How comfortable did you feel speaking with the pediatrician? Did you like speaking with her? Did she seem professional and knowledgeable? Was her office kid-friendly? Did they have a child-focused waiting area? Was the office clean, well-maintained, and baby-proofed? How did you like the staff? How was parking? Was it easy to get to her office? Did you have to wait a long time before meeting with her? Hopefully you now feel better prepared to find a pediatrician for your baby. You know how to filter a wide pool of candidates into a few you plan to meet. 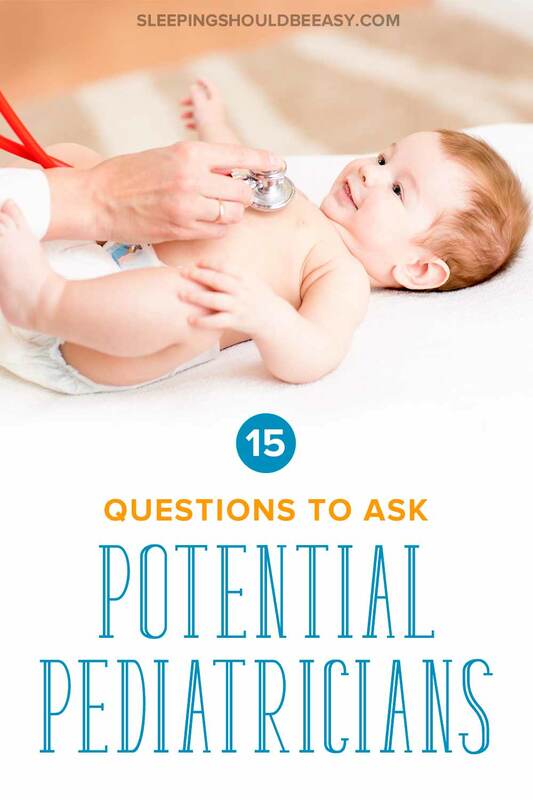 You also have the right interview questions for pediatricians to ask, as well as which observations to make about her practice before making a decision. After meeting with my son’s future pediatrician, I knew we made the right choice. The boys have been seeing this same pediatrician since my eldest was born, and I feel confident they’re in good hands. It’s nice to know they’ll also likely continue to see her for years to come. And to think it all started with one interview. Tell me in the comments: What are your top interview questions for pediatricians you definitely asked?